The 2019 Acura RDX was recently unveiled as the latest in a new generation of Acura vehicles. Showing off the company’s stunning new exterior design scheme, it also features something brand new to the Acura line-up: a brand new interior layout with all new available features. While the unveiled 2019 RDX is certainly an upgrade over the outgoing 2018 model, buyers in need of a new vehicle now will wonder: is it worth waiting for the new model or should you choose the current model? That question is of course dependent on your situation, but the information below will help you figure out what’s important to you and hopefully point you in the right direction. What’s New in the 2019 Acura RDX? 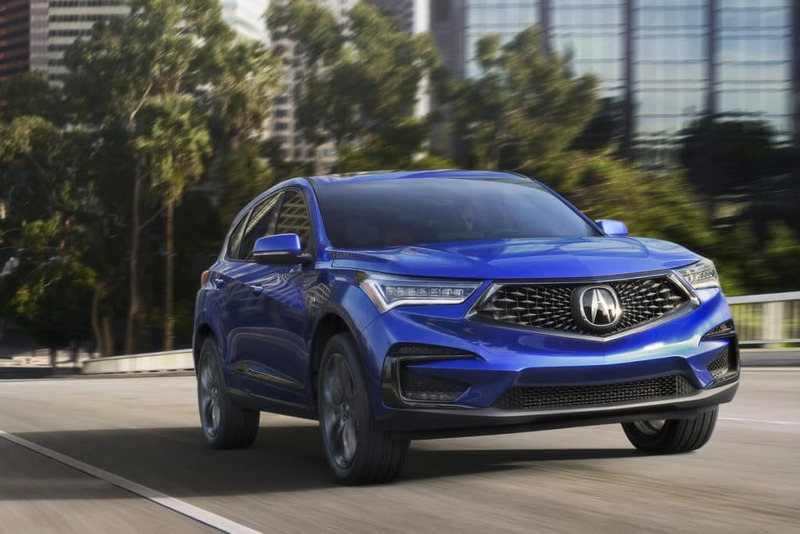 This vehicle has undergone a major remake, and the 2019 Acura RDX is the first model to fully demonstrate Acura’s new exterior AND interior design. While the 2017 MDX, 2018 TLX, and 2018 RLX featured exterior designs using Acura’s new design scheme, the interiors did not see many major changes. But with the 2019 RDX, Acura is unleashing a bold new interior layout with all-new features that are sure to impress. This third-generation RDX was reengineered on a new platform that featured a lighter a significantly stiffened body, a new powertrain, Acura’s Super-Handling All Wheel Drive, which gives the RDX the most sophisticated drive system in its class. This new design is completed with the distinctive front signature pentagon grille a sharply sculpted frame. Additionally, it is equipped with LED exterior lighting and next-generation LED headlights. The 2019 RDX also features a new Acura True Touchpad Interface, which combines the best elements of a touchscreen and remote interface all in one system. An Acura spokesperson described the new RDX as “a quantum leap forward in design, style and performance, with luxury features and technology that will elevate the ownership experience.” From its outstanding performance, spacious and gorgeous cabin and cargo areas to its variety of groundbreaking technologies, this luxury crossover SUV sets the bar high for vehicles in its class. While you are maneuvering across a variety of terrains in most any weather conditions, you can enjoy a new ultra-wide panoramic sliding moon-roof which is a standard feature of all 2019 RLX models. The sophisticated cabin that was designed to focus on the driver’s needs. The newly designed power sport seats have a matching sports steering wheel. The front seats are also heated and ventilated. Additionally, contemporary detailing that implements authentic, high-grade materials throughout the vehicle. The 2019 model will be powered by a new 2.0 DOHC VTEC Turbo direct-injected engine combined with a 10-speed automatic transmission defined by its crisp and refined shifting. This model offers four drive modes sure to intrigue the adventurous driver: Comfort, Sport, Sport+, and Snow. A drive mode dial is located in the center console, which allows drivers to tune performance settings with speed and ease. This premiere vehicle was debuted in mid-January 2018. Interested drivers should contact their nearest Acura dealer to receive more information and to get a spot on the waiting list for this amazing new model. How Does the 2018 Model Compare? Did you already fall in love with the 2018 RDX and simply can’t wait for the 2019 model to arrive? Cheer up! The 2018 RDX model—like any Acura vehicle—is an eye-catching and high-performing vehicle. The standard V6 engine results in strong acceleration and fuel economy. In fact, the 2018 RDX achieves and EPA estimated City: 20, Highway: 28 , and Combined 23 MPG*. This model is also equipped with an automatic transmission all-wheel drive. Not only is the Acura RDX well-made and well-equipped, but the RDX is a definite step up from less luxurious compact vehicles. It is common practice for car models to have multiple trim levels from which to choose. While options are often nice, they can often be overwhelming. Therefore, instead of featuring multiple trim levels, the Acura 2018 simply comes with more standard features. In addition, there are several packages to accommodate drivers’ preferences. AcuraWatch Plus: includes top-of-the-line driver assistant features including a forward collision warning and automatic braking system, a lane departure warning system, adaptive cruise control and a color trip computer display. Technology Package: includes blind-spot monitoring, rear cross-traffic alert systems, navigation system, GPS linked climate control, leather upholstery, and Apple CarPlay and Android Auto compatibility. adds ELS audio system, navigation and sport seats. Advance Package: bundles both the AcuraWatch Plus and the Technology Packages. This package also adds front and rear parking sensors, automatic wipers, fog lights, auto-dimming side mirrors, and ventilated seats. This package also include a remote engine start system. Who doesn’t love getting the heat or A/C going before you even step outdoors? The 2018 RDX does not feature the latest interior seen on the 2019 RDX. However, the 2018 remains a stylish, safe and performance-driven 5 passenger suv. Standard features include a power liftgate/trunk, leather seats heated seats, rear bench seats, keyless entry and start and a power moonroof. The suv also includes audio and cruise controls on the steering wheel, multi-zone climate control and a trip computer. Safety aspects include blind spot monitoring systems, post-collision safety system, upgraded headlights, alarm, tire pressure monitoring system. True, sometime choices are more trouble than they are worth. But most of the time, people strive to have multiple options. Therefore the “problem” of choosing between the 2018 or the 2019 RDX is a good one to have. And no matter which vehicle you drive off the lot, you know you have a safe, reliable, luxurious and great-looking ride to get you where you need to go. *Based on model year EPA mileage ratings. Use for comparison purposes only. Your actual mileage will vary, depending on how you drive and maintain your vehicle, driving conditions, battery pack age/condition (hybrid models only) and other factors. 20/28 city/highway.